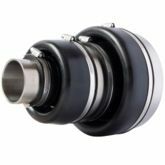 End seals fit all American and International pipe diameters. End seals are used to protect the annular space from debris. Type WA-N or type WA-U seals are fasten in place by stainless steel bands and clamps. 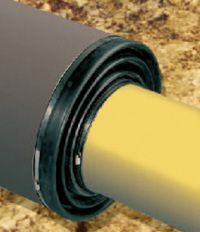 Seal elastomers are thick, rugged casing seals for installations where back cover fills are placed. End Seals pull over carrier pipe and over the casing pipe. WA-R-End Seals for large diameter casing differentials. 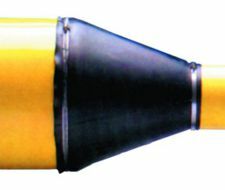 Very large carrier pipe and casing pipe diameter differences use an end sealed with a reducing sleeve as part of the assembly. End Seals type WA-R allow great flexibility. Casing end seals WA-MN for thermal or axial expansions. Several arc folds make up the seal. A clear space cavity for expansion and contraction must be maintained at the connection point. End Seal Type WA-U are fitted outside diameter casing to diameter carrier pipe. 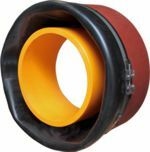 Large diameter pipe end seals for pipes with axial movement and lateral displacement. Stainless steel clamping bands fasten the rubber collars to the pipe and casing. For larger pipes special clamps are supplied with the units. If mounting to a wall pipe, allow 4 inch (100mm) sleeve extension outside the wall for clamping the seals to the pipe. End Seals Type WA-N protect pipe/casings up to 24 inch casing pipe. The elastomer rubber may be EDPM, NBR or Silicone depending on application requirements. 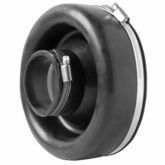 End seals come with stainless steel attachment clamp rings. Seals stretch 7% for size fitting. 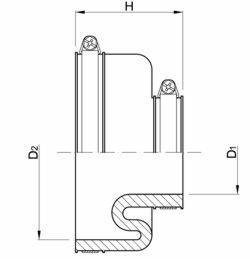 End seals may be replaced with pressure seals such as modular seal links or other annular space seals if pressing water is present. End seals, end seals for axial pipe movement, casing carrier pipe end seals, USA and Canada: USA: Texas, TX, Houston, New York, NY, Illinois, IL, North Dakota, ND, Iowa, IA, Ohio, OH, Michigan, New York, NY, Utah, Arkansas, Kentucky, KC, California, CA, Colorado, Denver, Louisiana, LA, Florida, FL., Pennsylvania, PA. Wisconsin, WI. Canada, Ontario, Oakville, Toronto, London, Hamilton, Mississauga. Alberta, AB; Edmonton, Fort McMurray Calgary. British Colombia, BC; Kelowna, Vancouver, Prince Rupert, Kitimat. Saskatchewan, SK; Regina, Saskatoon, Prince Albert, Esrevan, Swift Current. Manitoba MB; Winnipeg, Thompson. Quebec, QC; Montreal, Quebec City, Trois-Rieviers, Chebougamau, Sherbrooke. QC, Alberta, Saskatchewan, Manitoba, Quebec, New Brunswick, NS, newfoundland.